MASKerade: Muse Challenge #112 - Thank you! Muse Challenge #112 - Thank you! I can tell you that Vicki's loose, artistic water colouring scared me a little bit at first and I think it may have scared some of you too - not too many cards in the gallery as I post this! But I hope that my card shows that you can make a card that is your own style but still inspired by Vicki's! I focused on the colours, the pierced circle element, elements of the layout and the scripty sentiment. I decided to only have one black stripe and I decided that rather than dividing the card front top and bottom, I would divide it left to right. I used a mask of a flower die - sponged once in Salty Ocean then turned and sponged again in Mustard Seed (it blended and turned a bit green!) by Sue Wilson and popped in some orange by using an enamel dot. My scripty Paper Sushi thank you also helps to tie my card back to Vicki's. So, be brave! Take a shot! The deadline is Monday at 8 am. At that time you can vote (even if you don't link up a card) for your top 3 until Tuesday at 8. The voting results will be posted Tuesday at noon. I hope to see you there! I wondered how you'd 'stamped' that flower Ardyth - how on earth have you masked it so perfectly?! It looks gorgeous with the contrasting orange dot! A beautiful and true Ardyth interpretation. Can I borrow your eyes for a few minutes? Now that's brilliant :) beautiful take ! You always see just the right elements in an inspiration card to make it in your own graphic style, Ardyth. Beautiful card Ardyth! I love the boldness you achieved! W-O-W Ardyth. Love the colors you used and so makes me smile. Love how you were inspired Ardyth! Another very pretty card Ardyth! Also, so glad you posted Vicki's inspiration card. I followed that link, then the link to the store for Small Birds stamp and placed a sizeable order (gave you both credit also!) Thanks for sharing! So cool! Your sponged flower is fabulous! I think your post will encourage more of us to follow bravely in Vicki's shoes! Love the split panel and LOVE the orange enamel dot! Wow! Masking perfection on your gorgeous flower, Ardyth. Fabulous take on the Muse. Your masking technique is amazing! Great card. 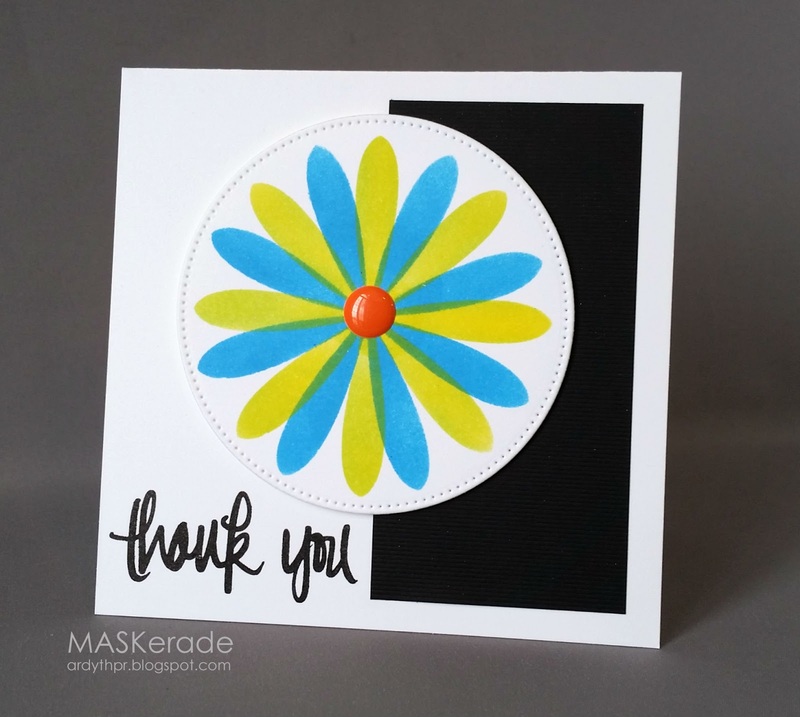 Fabulous card...love your beautiful flower!